A little utility for Mac OS X that adds a Open Workspace menu entry which when activated opens the selected workspace in a new Eclipse instance. In addition Eclipse instance icons get a badge with the workspace name. This can be set in Preferences > General > Workspace. If unspecified the last segment of the workspace path will be used. Note that OS X 10.6 or newer is required as this feature relies on the open command's ability to pass on arguments. 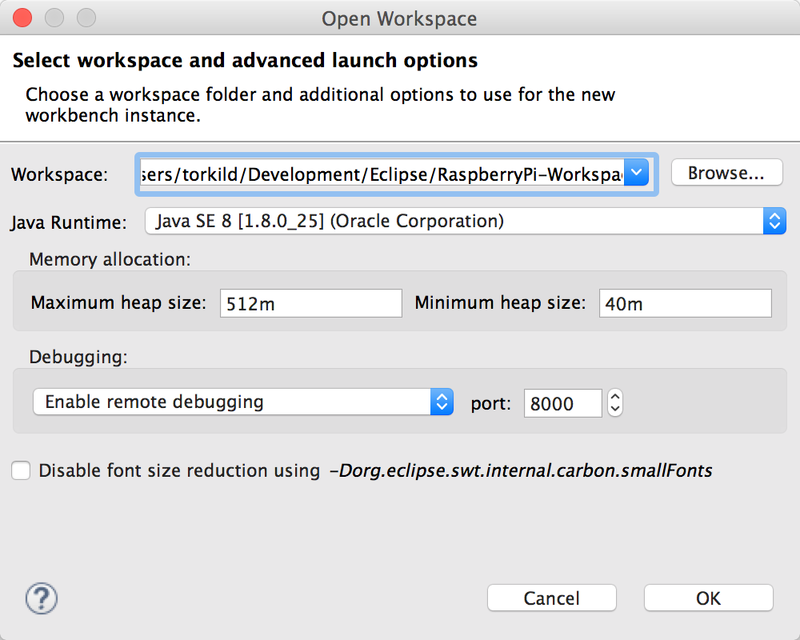 Eclipse IDE 3.7+ and Java 1.7 or better is also required. Issues are reported in GitHub and comments go to @torkildr. By adding the following code below to your website you will be able to add an install button for OS X Eclipse Launcher. I was using this plugin on eclipse Luna and it was working perfectly. I recently upgraded to eclipse Photon and installed plugin again. Now, everytine I restart eclipse, badge gets cleared. After I go to eclipse->preferences->workspace : and change workspace name to different value, it comes back. Any idea ? Using Eclipse EE 4.10, it is not possible to find the plugin in MarketPlace using the internal client whatever the query string. Browsing in the MarketPlace using the internal navigator, it is possible to find the plugin but the Install button does not work. I installed the plugin adding the source site as source in the 'Install new software' menù. Thanks for the heads-up, the issue has been adressed now. Finally installed using update site. But having it in marketplace helps. many thanks. I was missing this little feature for quite a while. Now, it is back again. Great! Great little plugin.. was really frustrating on Mac for a while there launhing open -n eclipse.app from the cmd line. Latest Eclipse Oxygen3a, java 8, High Sierra - Working with no issues. Not working on Eclipse Oxygen 2 - 4.7.2 with java 8 on Mac Siera 10.12.6. The plugin installs, but could not see the "open workspace" option in the list of File menu. Little gem for mac users. This plugin really helps when working with multiple workspaces. The tool is really useful on OS X. Unfortunately since I updated to Eclipse Mars .2 the badge icon disappears some seconds after eclipse launch. Any chance to get this fixed? The problem here is that Eclipse Oomph changes the badge label to whatever is set in the workspace name preference. If not set, Oomph will clear the badge label while this utility will use the last segment of the workspace path. I'll work with the Oomph team to remedy this. Just upgraded to Eclipse Mars, and the first thing I added is the indispensable OS X Eclipse Launcher plugin. Thanks for this useful little plugin! This plugin has stopped working after upgrading to OSX Yosemite. Anyone else having this issue? In the new 2.0 version some code was introduced that required Java 1.7 instead of 1.6 as before. Make sure Java 1.7 or newer is used for Eclipse if you're also using this plugin. If you're on Luna you should also be on at least 1.7 since most bundles require this. Upgraded to luna and this wonderful plugin still works as a charm!! :) - Thanks for a great plugin! I just migrated to a mac, and not being able to open multiple eclipse instances was a problem to me. This plugin is very useful, solves this problem perfectly. Just what I needed!